Thank you for purchasing and using our products. We would like to announce the firmware update for the SIGMA MOUNT CONVERTER MC-11 EF-E. This firmware update allows it to be compatible with the SIGMA 135mm F1.8 DG HSM | Art (Release: April), SIGMA 100-400mm F5-6.3 DG OS HSM | Contemporary (TBD), Cine Lens 50mm T1.5 FF EF mount from FF High Speed Prime Line (TBD) and so on. B&H carries the Sigma Mount Converter MC-11. All three firmware updates resolve an underexposure issue when the lens is used with a Nikon D500. The 120-300mm f/2.8 DG OS HSM Sports firmware update is only required if using a TC-1401 or TC-2001 teleconverter with the lens. Sigma Global Vision lenses (like the ones above) can be updated using Sigma USB Dock. Before updating, be sure to download and install the latest version of Sigma Optimization Pro. If you do not own a USB Dock, you can send your lens to a Sigma Service Center and have its firmware updated free of charge. However, considering the cost of shipping a lens insured and the universal nature of the dock, simply buying the USB Dock seems to be the most practical way to update your lens' firmware. For customers who own the following applicable products and also SIGMA USB DOCK, please update the lens firmwareusing SIGMA Optimization Pro. * For customers who are using SIGMA Optimization Pro Ver1.1 or earlier, please ensure to update it to Ver1.3 from the Optimization Pro download page before updating the lens firmware. B&H carries the Sigma 150-600mm f/5-6.3 DG OS HSM Sports, 150-600mm f/5-6.3 DG OS HSM Contemporary & USB Dock. We would like to announce the update in the lens firmware of the SIGMA 20mm F1.4 DG HSM | Art Canon and SIGMA 24-35mm F2 DG HSM | Art Canon on the SIGMA Optimization Pro. The latest firmware update makes it fully functional with the Canon Digital Cinema Camera EOS C300 Mark II. For those customers who own the following products, please update the firmware of the lens via the SIGMA Optimization Pro. It becomes fully functional with the Canon Digital Cinema Camera EOS C300 Mark II. For SIGMA 20mm F1.4 DG HSM | Art Canon, this lens firmware update also corrects the phenomenon that the images show some underexposure when "Evaluative Metering" or "Center-weighted Average Metering" is selected on Canon EOS-1D X Mark II. Please be sure to update SIGMA Optimization Pro to the latest version before upgrading the lens's firmware. We appreciate your consistent support for our company and products. B&H carries the Sigma USB Dock. We would like to announce the availability of new firmware and support for the applicable lenses regarding the phenomenon that exposure of the image may not be accurate, which was announced on May 27th, 2016. This happens when some SIGMA interchangeable lenses for CANON are used on Canon EOS-1DX Mark II. Thank you for your patronage to SIGMA products. The firmware update requires the installation of the latest version of SIGMA Optimization Pro on your personal computer and the SIGMA USB DOCK accessory (sold separately). Further details on this firmware update will be announced at a later date. B&H carries the Sigma 150-600mm lenses and the USB Dock. The Sigma Corporation is pleased to announce that the lens firmware update for the 150-600mm F5-6.3 DG OS HSM | Sports SIGMA, CANON and NIKON is available through SIGMA Optimization Pro, the dedicated software for the SIGMA USB DOCK. The latest firmware enables the lens to offer improved Optical Stabilization in OS mode 2, which is optimized for panning photography. By taking advantage of the new OS algorithm in OS mode 2, it provides effective compensation, not only in horizontal direction, but also vertical and diagonal directions. For those customers who own the following product, please update the firmware of the lens via SIGMA Optimization Pro. Should the version of SIGMA Optimization Pro not be updated to Ver. 1.2 yet, please be sure to update it before operating any lens firmware update. B&H carries the Sigma 150-600mm F5-6.3 DG OS HSM Sports lens. Canon Mount Firmware 1.03 – It has optimized the lens firmware for SIGMA TELE CONVERTER TC-1401 and TC-2001. Note: Before upgrading the firmware of 120-300mm F2.8 DG OS HSM S013, please first update your SIGMA Optimization Pro to Ver1.2.0. Download via Optimization Pro Software and install via Sigma's USB Dock. B&H carries the Sigma 120-300mm F2.8 DG OS HSM Sports Lens. We are pleased to inform you the SIGMA 120-300mm f/2.8 DG OS HSM F/CANON Firmware Update is now available. This firmware update allows you to use the SIGMA USB DOCK with the SIGMA 120-300mm f/2.8 DG OS HSM F/CANON. If you have the products mentioned below, please start up SIGMA Optimization Pro and then operate lens firmware update. It has improved the Auto Focus speed of "Standard" and "Speed-priority" modes. It has improved the focus accuracy when it is mounted on Canon EOS-1D Mark III or Canon EOS-1D Mark IV. Please update to SIGMA Optimization Pro Ver1.2 before operating firmware update of SIGMA 120-300mm f/2.8 DG OS HSM S013 F/CANON. Note: Apparently, blogger/photographer JerseyShooter had a big hand in alerting Sigma to the need for this firmware update. Check out his blog for more info. 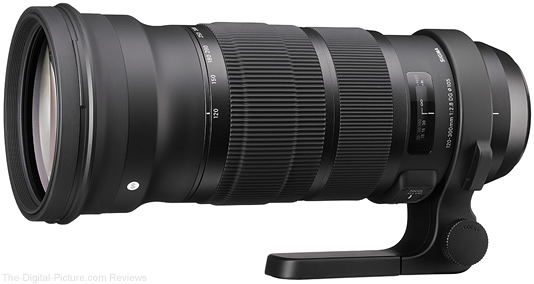 B&H carries the Sigma 120-300mm f/2.8 DG OS HSM lens and the Sigma USB Dock.